We are all attracted to light in its many forms. The sunlight, the light from a house window, bright shop-windows in a winter high street, and what about the ‘lightness’ in humour, and a ‘light-handed’ manner which we find so charming. What is the most attractive aspect of the human face? For me it is definitely the sparkle in someone’s eyes. Don’t we just melt as a baby’s eyes light up when it giggles and coos? That light in the eyes, which is said to reflect the human soul. As I’ve probably mentioned many times before, when I was a little girl one of my favourite Sunday School songs was ‘Jesus wants me for a sunbeam’, and I would sing it at the top of my voice. Now for almost twenty years my website has been called AngelLight, and my next book is to be called Seven Steps into the Angel’s Light. For ever and ever I have had a deep knowing that we are beings of ‘Light’, pure spiritual energy, having a down to earth human experience. By that I mean that we are sparks of the one Divine Light. Tiny aspects of the God-Source, the one loving and magnificent, all-knowing Creator. Science has proven that light is the fastest moving energy in the Universe. So, for me, and many more like me, who are teaching about energy and the relationship between physical and spiritual energies I am delighted that so many more people are starting to ‘get it’. The point is that we are talking about not just the light we see by and take for granted, but Light, the Divine intelligence that is in all things. Light is in the foundation of all form in the universe, Light is life in all things, the centre of all things, and in each and every one of us. When we are living within the source of light, there can be no darkness. When we are seeing through the eyes of love, there can be no judgement, no criticism and no condemnation, we are then living in the light. It’s my passion to ignite the spark of Light within hearts which may for whatever reason have lost their shine. Like most people I’ve experienced my own shadows and know what heart-ache feels like. During my re-emergence from a deep ‘dark night of the soul’ I was lucky to find a teacher who mentored me without judgement. Two of the first books I was recommended to as I re-entered my spiritual life quest in my thirties were: Living in the Light, by Shakti Garwain, and The Awakener, by Sandy Stevenson. Both of these books certainly re-ignited the light within my soul. They spoke to my heart. 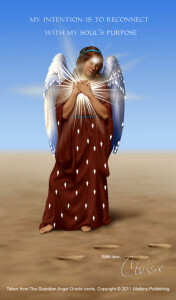 Then I found more and more books, and courses, that reminded me of the beings of Light we know as angels and archangels. Now I’m teaching people how to re-connect to these energies for themselves. There are many shadows cast as our own light becomes brighter. And just like like a giant ocean wave we surf that tide of enlightenment with its many energetic sensations, and its highs and lows. But ultimately, our goal is to become pure light once again. Living a life where there is only pure love, no darkness no condemnation, no judgement. Love this, beautiful, no hiding, just shining.